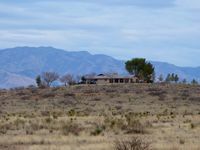 119 Acre Horse Property/Hilltop Home - Pearce - Cochise County, AZ - Headquarters West Ltd. 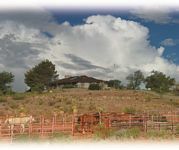 Location Pearce is a small, rural town in the Sulfur Springs Valley of southeastern Arizona and is often linked to the adjoining town of Sunsites. 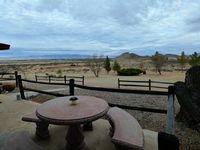 At just under 4,400’ in elevation, the climate is considered favorable for farming and the area is vital to the developing vineyard/winery industry in Arizona. The vineyards in the region are active and draw tourists for wine tasting tours and festivals throughout the year. Pearce found its place in history with the discovery of gold and the development of the Commonwealth Mine in 1896. The mine continued producing gold and silver until it closed in the 1940’s. After the mine shut down, the residents moved on and Pearce became considered almost a ghost town. Several of the original buildings, including the General Store and Our Lady of Victory Catholic Church, have been added to the National Register of Historic Places. 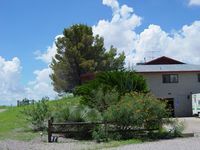 There are several businesses in the Pearce-Sunsites area – including a clinic; small, local grocery store; a hardware; and mechanic shops – and general shopping and medical services are available in Willcox and Benson, AZ, approximately 27 and 36 miles away. Tucson, AZ, the second largest city in AZ, lies about 70 miles to the northwest. Tucson offers major medical services, shopping and entertainment, the University of Arizona, and Tucson International Airport. 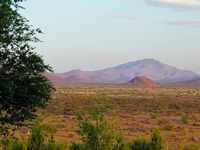 Southeastern Arizona is a region steeped in history and western lore – from the famous shootout between the Earps and Cowboys at the OK Corral in Tombstone; to the conflicts with the Apaches, including Cochise and Geronimo; to the well-documented travels of Father Kino as he made his way across the southwest. 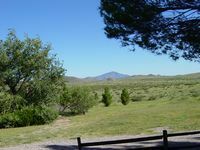 The area is rich with natural wonders including Cochise Stronghold; Texas Canyon; San Pedro River National Conservation Area; numerous mountain ranges; and Kartchner Caverns. 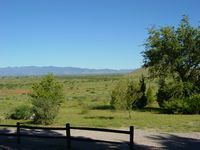 With a mild climate, the area offers year round opportunities for a variety of outdoor activities including horseback riding, hiking, bicycle riding, motorcycle touring, and more. The average high temperature in Pearce reaches the mid 90’s in June, with mornings in the 60’s. The average low temperature drops to the low 30’s in January, but warms in the afternoons to the 50’s and low 60’s. Average rainfall ranges from 12 to 15 inches, with most of the moisture coming during the monsoon season, typically lasting from early July to mid-September. Morning clouds build to beautiful afternoon and evening storms. Beautiful hilltop home! 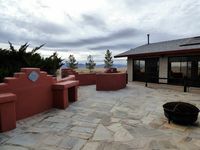 This is a custom, 3,488 s.f., 3 bedroom/3 bath, that was built on the highest point of the property. Patios and porches placed around the home allow spaces to relax, entertain, and enjoy the 360⁰ views across the Sulfur Springs Valley to the surrounding mountain ranges. 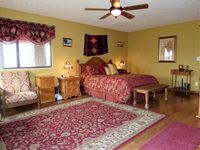 Spacious rooms and ample windows lend to the relaxed atmosphere of the home. A large office room has interior and exterior access. Granite tile countertops, double ovens, plentiful, and the built-in wet bar combine to create a kitchen perfect for entertaining. 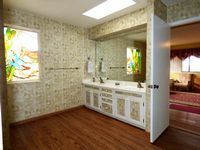 The Master Suite has room enough for a sitting area and a door in the en suite bathroom allows direct access to the enclosed pool/spa room. 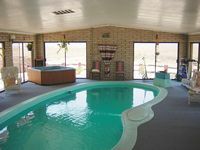 Sliding glass doors surround the solar heated pool and allow for year-round pool access for exercise and enjoyment. An over-sized 2 car garage/work shop is accessed via an interior elevator located by the kitchen and the paved area in front of the garage has been used for basketball and as a tennis court. 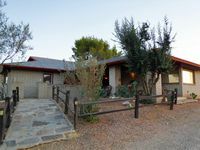 The parcel is comprised of 119.79 acres of mostly level land surrounding the hill the home sits upon, with additional, adjacent 20 acres available. 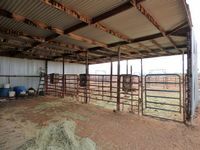 The property is perimeter fenced with 2 covered stalls, a set of panel pens, and plenty of room for a barn, arena, turnouts, pastures, and additional pens. Currently, 12 head of cattle graze the land. The utilities include electric from SSVEC, a private well, and private septic. The living areas are heated and cooled by central air and a heat pump, and a fireplace insert in the Great Room works well as an alternative to heat the living areas. 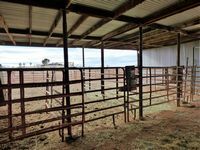 This wonderful property is full of possibility and could lend itself well to being developed into a horse breeding/training facility, a vineyard, Bed and Breakfast, or even just a comfortable family home or retreat. Additional 20 acres available.